UNIQUE + ETHICAL ADVENTURES. Elephant care in a jungle sanctuary, trekking, Karen hill tribe visits, homestays and bamboo rafting in Chiang Mai, Thailand. The Chai Lai Orchid offers sustainable, eco-friendly tours including elephant experiences, day treks and overnight homestays in hill tribe villages. All of the above plus an overnight homestay in a Karen hill tribe village. Voted by guests as their most eye-opening, authentic cultural experience. Miles away from the bustling city and tourist traps you have a chance to unplug and relax. Enjoy dinner cooked over the fire and peaceful nights under the stars as you learn from your hosts about the traditional Karen way of life. Learn what it’s like to care for an elephant! Meet our elephant family, including three adorable baby elephants. Get messy while giving back! Bathe elephants in the river and learn how your elephant spa experience helps to create a safe and permanent sanctuary for them. In order to keep the price down you bathe the elephants together with other guests. But don’t worry, you will have plenty of time and one-on-one photos opportunities with the elephants! BONUS: End the experience by swimming in a beautiful jungle waterfall! Can’t decide? Mix and Match our tours to make your own bespoke adventure! What date would you like to begin your adventure? How many guests will be taking part in your adventure? Please provide the name and phone number of the hotel where you need to be picked up. If you're not sure yet, you can let us know at a later date by email. Which tours would you like to book? Welcome to the Chai Lai Tribe! We believe that we can travel and do good. In addition to helping the elephants, your contribution funds our anti-trafficking nonprofit Daughters Rising. For your convenience, we offer several payment options. Please let us know what you prefer. See you in Chiang Mai! Don’t like to be tied down? Build a custom adventure by combining fun things to do in the Chiang Mai AREA! Please give us the name and number of the hotel from which you wish to be picked up. If you don't know yet, you can let us know later by email. Get off the beaten path and learn how to live in harmony with the jungle the Karen way. On this private 2-day trek you will experience Karen hill tribe cultural immersion and learn jungle survival skills such as foraging for herbal medicine and weaving from knowledgeable indigenous Karen hill tribe guides. Traditional Sak Yant (also called Sak Yan, or Yantra) tattoos are hand-etched onto the skin using ancient geometric designs mixed with Buddhist prayers. They are believed to give the wearer magic powers associated with healing, luck, strength, and protection against evil. Chaing Mai has some of the best tattoo artists in the country. Enjoy the thrill of flying over the jungle canopy. On the zipline you will glide through breathtaking views of the lush jungle mountain landscape. Great fun for families. We work with ziplines who promote community-based tourism and support hill tribe communities. Escape the hustle and bustle of Chiang Mai for a day and come and enjoy the serenity of nature with a guided romp through local jungles and farm lands. Have fun and get dirty! Cooking Thai food is an art form and you can learn to cook in Chiang Mai! Cooking classes can me 1/2 day or full day and include a cookbook so you can take your new skills home with you. A great opportunity to enjoy Thai cooking and culture. Possibly the best souvenir. Forget selfies and pestering strangers, your own personal travel photographer will capture highlights of your journey in a contemporary and candid style. Return home with amazing photography of your travels to share with friends and family. Created to showcase the traditional Northern Thailand, Lanna, culture. Enjoy authentic traditional Thai food kanthoke style. Highlights include the Thai fingernail dance and the swords dance which was developed from an ancient martial art. Striking canyon located in Mae Wang national park features sandstone pillars 30 meters high. Pha Chor is natural phenomena caused by an uplift of one of the Earth’s plates and also by erosion of wind and rain. One of our guest's (and staff) favorite day tours. Workout + Chill + Swim while soaking up the sun and taking in the views of Chiang Mai's stunning jungle and countryside. One of Thailand's most stunning national parks. Doi Inthanon is the highest peak of the Inthanon Range (2,565 meters). The altitude of the park has given rise to a unique flora and fauna, cloud forest, which isn't found in other parts of Thailand. The park is home to some very spectacular waterfalls. 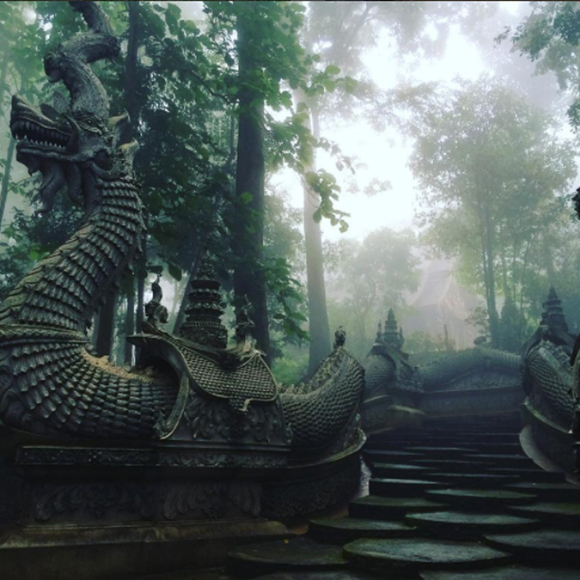 Doi Inthanon is great to visit anytime of year but the waterfalls are at their most spectacular from May through November. Get to see the beauty of the jungle and swim at waterfalls. Trip includes English speaking Karen guide and lunch. This expansive animal park is open day and night, but the real action happens after dark, when you can view all sorts of critters from the back of an open-sided tram. You can get close and feed many exotic animals, including giraffes! Great for children! Soak us the sunshine and enjoy the cool river while floating down the river on a traditional bamboo raft. Give an elephant a scrub and cool her off in the river. You can have your own elephant or share with your friend. JUST LOOKING FOR A RELAXING JUNGLE EXPERIENCE? COME STAY WITH US AT OUR JUNGLE ECO LODGE-- THE ONLY AIRBNB YOU CAN LIVE WITH ELEPHANTS!